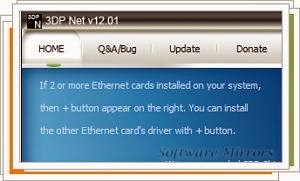 3DP Net is a freeware program that helps you detect and download the drivers for the network card. Not only that, but if we have some suspicion about the kind of driver you are going to download, we can install a generic driver that will at least allow us to connect to the Internet to download the driver that we please. If you have formatted your computer recently, you already know that the first thing you must have in place with the new installation of Windows is the network card. With Internet access you can start downloading everything you want for your new system, both Windows updates as more appropriate browser than the IE or other programs. The problem is that if we have not supported the driver to connect to the network, obviously we can not connect, so that we can never get the driver via download. But many users we have found more than once similar with this situation. Fortunately, 3DP Net gives us the solution. The download page mentions that 3DP Net supports multiple card drivers, but there are so many brands and models as there would not be surprising that the program could not get us the driver for our specific model of card. The situation is settled with the installation "emergency" in this generic driver.